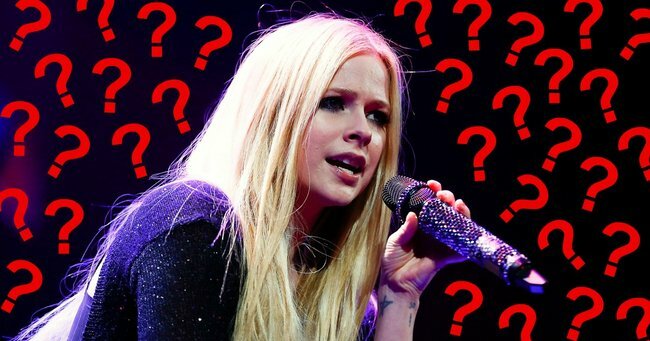 The Avril Lavigne conspiracy theory that says she died in 2003. The world thinks Avril Lavigne died in 2003. Yes, really. If we were to believe every conspiracy theory we read then we’d say George Bush was behind 9/11, Jay Z and Beyonce are part of the Illuminati and Paul McCartney died in 1966. But the one thing conspiracy theories have in common is they all have a significant amount of ‘evidence’ that backs them up. The latest news in celeb conspiracy theories? Apparently our favourite punk-rock early 00’s singer, Avril Lavigne, died in 2003. Avril Lavigne in 2003, was this the last time she was seen alive?! Image via Getty. The theory comes from a Brazillian fan site who claims the &apos;original&apos; Avril was replaced by a &apos;new&apos; Avril, an actress, thirteen years ago. The site offers composite photos of original Avril and her double, &apos;Melissa Vandella&apos;, to show the differences between the two. "As we all know, it is a popularly believed that Canadian pop singer Avril Lavigne took her own life in 2003 shortly after her parents divorce and was replaced by a doppelganger who left several clues about the death of the original Avril Lavigne in the lyrics of her follow-up album." "She wants to go home, but nobody&apos;s home. It&apos;s where she lies, broken inside. You can watch the full Nobody&apos;s Home video below Post continues after video. Yet, Vulps turns the table on us again when they announce the original Avril is ACTUALLY STILL ALIVE. Yep, and the proof Vulps has that she is? When new Avril announced she had Lyme disease, original Avril was spotted buying cheese. Vulps reveals the Rangers feel they have been betrayed because original Avril deceived them for over a decade. "Why did she construct such an elaborate lie to deceive her fans? Was it because we didn&apos;t take Complicated to number one? The Grammy losses to Norah Jones? Or did her record label have a part to play in this?" Vulps wrote. New Avril with her husband, Nickleback frontman, Chad Kroegar. Image via Getty. We may never know Vulps, we may never know. "The old Avril showed up in Here&apos;s To Never Growing Up. She obviously supports New Avril." Interesting, though, that the new Avril looks and sounds exactly the same as the old Avril.